A new app is out today that is fun and could be a powerful tool for teachers. 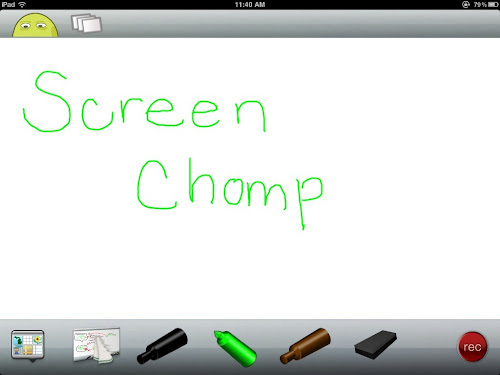 Screen Chomp for iPad is a recordable whiteboard (in a previous post I mentioned ShowMe a similar app). Screen Chomp is more intuitive- my 7 yr old was recording a birthday greeting in moments for his uncle. Use it for assessments, send home homework and instructions to a sick student, record your lesson and play it on the board while you circulate and help students. As of today it was free, so go get it! click here >>> for a Screen Chomp recording of me playing with it! I'm currently looking for ways to create short videos to show parents the maths strategies that we use in the classroom (and thinking that screen chomp may be the solution). I couldn't see an option for sharing though - can you tell me how you embedded it onto your blog? Do you have any other suggestions for tools for creating videos that are easily embedded?